Canadians seem to still like to shop the old-fashioned way – in person and in store. While other shopkeepers across the globe are vying for custom against e-retailers, the Canadian bricks and mortar stores are still enjoying healthy trade, with an impressive 92% of all sales occurring in-store, as opposed to online. With more than 229,300 stores across the nation, running a shop in Canada is highly competitive. There are some key traits all shopkeepers should have to remain successful in this demanding industry. Engage with your customers, get to know them on a personal level and offer a tailored retail experience; by doing this, you could turn a first-time buyer into a regular customer. Try to get a mailing or email address from your customers to maintain regular interaction with them. Ask customers if they’re happy to be photographed for your social media pages and tag them; this is a great way to not only keep in contact with customers but also reach out to their followers and show off your products. Posting Instagram photos of your window display, or employees trying on new stock is a great way to show off your store without the hard sell. If you’re sending out marketing material such as a newsletter, make sure it’s relevant to that individual customer. If they have a loyalty card with your store this will be easier to achieve as you will have key information such as their age, location and purchase history. Your employees are the face of the business, so they need to be on board with this too; encourage your staff to interact with your customers and praise those who do. In addition, extend this mantra to your employees and suppliers. Making your staff feel valued and appreciated will boost the team morale and work ethos. Working in retail can have its setbacks; long hours, standing on your feet all day and working weekend shifts. To create a team that enjoy working at your store, give a motivational speech before the store opens, or offer rewards for workers who make a customer laugh or feel happy that day. You should also welcome suggestions on how to improve the store, and keep staff up-to-date with new plans for the business. Selling a product that is difficult to find elsewhere or stocking a large variety of a certain item could set you apart from other shops in the area, and help you compete with e-retailers. Something that internet shoppers can’t find online is expert in-person advice and physically seeing, holding and trying on products. Whatever your store sells, whether it’s gifts, homeware or antiquarian books, aspire to be a specialist in your retail category. Both you and your staff should be knowledgeable about the brands you stock and their products; find time to train employees so they can give informative advice to shoppers. To survive on today’s high street, create a niche for your store and brand; whether that means selling greeting cards that have been designed in-store or stocking products that are only sourced through ethical, green-operating companies. Make sure your USP is in line with your clientele and the demographics of the area you’re in. For instance, a store in Vancouver which will be more of a destination store will need to aim to customers who need a good reason to visit – therefore offering new stock on regular rotation will be the main attraction. 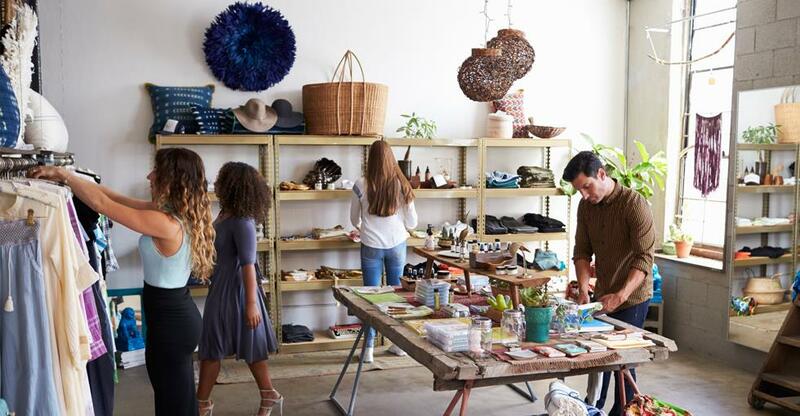 Whereas in a more densely populated location like Toronto, your demographic is more to the regular customer who pops in for a quick browse – so your store should be attractive through flash sales and great deals! Window displays are also a great way to show off your shop’s personality; even if you’re selling something as simple as stationary, you can still display your stock in a visually stimulating way that can help draw in customers through your doors. Make your displays topical, unusual and appealing by using bright colours or stand-out designs. Integrate all your business systems so that everything is interlinked, from stocktaking and inventory to payments and invoicing. Research different cloud-based data applications that will best suit your business; if you’re not tech-minded, ask for advice from family, friends or other experts in the retail sector. Advances in technology can help you refine your current processes and free up a lot of your time to concentrate on other aspects of the business, such as marketing or recruitment. If you’re not tech-savvy, employ someone to integrate a new data application and book tutorials on how to use and manage these apps. It is also a good idea consider having an additional online sales channel to help your customers shop with you at their convenience. Embrace change and technology wherever possible as this will help your business stay fresh and innovative!